> Electric Structural Principle Gk-2300, Avoiding The Traditional Locator Output Due To The Shock Caused By The Mechanical Properties, Such As Zero Drift Unstable Performance Weaknesses, So That The Control Valve Is More Stable. > German Piezoelectric Valve Action Time < 20ms, High Positioning Accuracy, Reduced Valve Opening Due To The Shock Caused By Inaccurate Positioning, Improve Valve Control Accuracy. > Gk-2300 Valve Characteristic Curve Correction And Sub-Process Control Function, Scalable Control Valve Applications. > Gk-2300 Has A Lightning-Enabled Smart Valve Positioner. > Gk-2300 Uses A Special Design, The Internal Pressure Of The Formation Of Microseismic, Isolated On The Outside Air Infiltration Chamber, More Adapted To Complex And Harsh Working Conditions. > Gk-2300 Uses No Mechanical Electrical Conversion Unit, Fully Sealed Structure, The German Piezoelectric Valve Mtbf Up To 20 Billion Times The Switching Frequency, High Reliability. 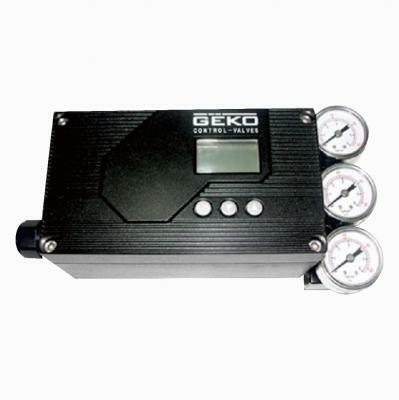 > Gk-2300 Comes With The Oscillation Phenomenon Flow Regulating Device Can Be Precisely Controlled By The Base Knob Actuator Input To The Air Flow, Thus Eliminating The Small Capacity Of The Actuator. > Gk-2300 Comes With Three Off To Secure His Position, With No External Solenoid Valves, Lock Valves And Other Accessories Can Achieve Self-Protection Valve Interlock Switch Output Or Switching Valve Action To Avoid Failure And Jeopardize Production. > Gk-2300 Using The World's Latest Technology And The German Electrical Conversion Piezoelectric Valve, The Steady-State Air Consumption Of Less Than 36 Liters / Hour (Conventional Positioners 400 Liters / Hour) Of Electricity A Year Could Save More Than 1400 Degrees (Petrochemical Energy Calculated To International Standards). > Gk-2300 May, Within One Minute Self-Tuning Zero And Stroke Tuning Scene Without External Signal Source; High Volume Applications, You Can Download The Communication Parameters; All Operations Completed Just Three Buttons. > Gk-2300 7 Character Lcd With Double Rotating Opening And The Optional Pressure Gauge Shows Clearly Intuitive Reaction Site Conditions. > Gk-2300's Unique Emergency Mode, You Can Not Open The Case In The Field Of Direct Manual Operation Of The Closed Shell Valve.